Yep, we give a quick, quick review about the latest Star Wars film. 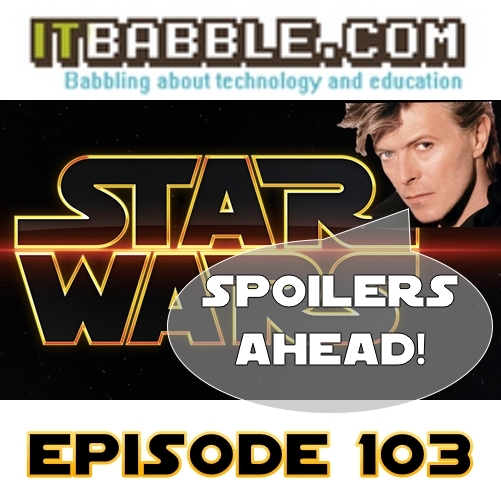 We also lament on the passing of David Bowie, talk about our favorite Google Chrome add-ons, a quick and dirty how to on podcasting and a quick PSA. All in all, it’s a packed show. Check out the links and talking points below. As always subscribe to us on iTunes, follow us on Podomatic and subscribe to us using your favorite podcasting app. – Only Version 11 is left! – You can still use it but . . .
– Advice for teachers out there? You can listen to it the episode below or download the MP3 HERE! This entry was posted in Podcast and tagged chrome add ons, david bowie, internet explorer, star wars. Bookmark the permalink.